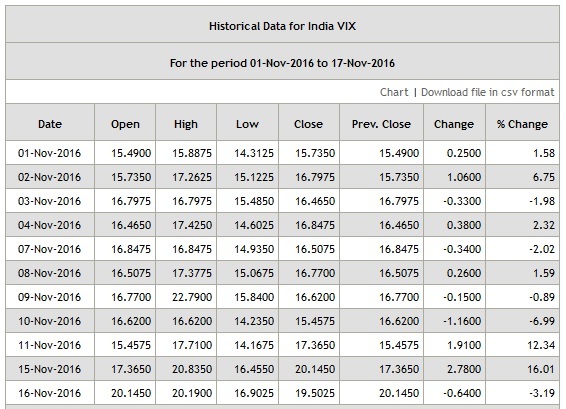 In this article learn what Is INDIA VIX And why it changes in the stock markets. As you can see INDIA VIX Is Continuously Falling, what does it indicates? You can see INDIA VIX here. First what is INDIA VIX? INDIA VIX is measurement of Indian Stock Market Trading Volatility. VIX is Volatility Index in stock markets. 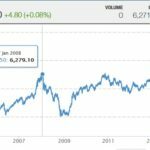 It is measured the way patterns in trades changes in the markets, or are expected to fluctuate in coming days. If too much trading is done or is expected due to some event, which is above normal trading days, Volatility Index increases. It usually increases before some big news is announced because it is a clear sign that too much trading may happen. Like the recent US elections. Why does it increase before the news is announced? The reason is obvious that too much trading will happen because traders get panicked and to save their positions start investing in speculative shares (greed following), or buy/sell too much calls and/or puts (again greed following). It does not matter to markets who wins or who loses money, but Volatility Index sees or is expecting to see abnormal trading patterns and increases accordingly. Once the news is announced it starts to fall. Why does it falls after the news is announced? It is simple, traders start to close their positions. Buyers become sellers, and sellers become buyers and trading slowly starts to get back to normal. And frankly this is expected after the news is announced so VIX starts to fall. When the VIX measurement software sees trading patterns getting back to normal it starts to fall. Of course it takes some time for the trading pattern to get back to normal as not everyone closes their positions the next day. Some do the next day itself or same day so most VIX falls the next day itself of the news announcement day. You can go back to INDIA VIX history and see that the max fall of -6.99% was on 10-Nov-2016 when the final results of Donald Trump winning the US elections was clear by night of 9-Nov-2016. After that there was an increase of 12.34% but it had to do with a different news – The Demonetization of Rs. 500 and Rs. 1000/- notes and its effects in Indian economy. People were confused and trading patterns changed. This is a good question in the comments section and I think this must be included for everyone to read. Question: Is the increase or decrease of India VIX associated with bullishness or bearishness? Answer: No. Usually VIX and Nifty are inversely related as far as direction is concerned. If you see Nifty and India VIX history, whenever Nifty falls India VIX increases and whenever Nifty rises India VIX falls. But it has nothing dodo with Nifty as VIX is least bothered about what is happening to Nifty. As written in the article above VIX increases due to panic among trades and expectation that speculative trading will start. Sometimes you will see Nifty will rise still VIX will also rise and vice versa. So basically VIX movement has its own set of rules and Nifty has its own. Inverse relation is mostly just a coincidence. Hope it is now clear why India VIX changes everyday. If you have any more doubts please ask in the comments section given below. If the question is good it will be included here in the article for everyone’ benefit. Is the increase or decrease of India VIX associated with bullishness or bearishness? No. Usually VIX and Nifty are inversely related as far as direction is concerned. If you see Nifty and India VIX history, whenever Nifty falls India VIX increases and whenever Nifty rises India VIX falls. But it has nothing dodo with Nifty as VIX is least bothered about what is happening to Nifty. As written in the article above VIX increases due to panic among trades and expectation that speculative trading will start. Sometimes you will see Nifty will rise still VIX will also rise and vice versa. So basically VIX movement has its own set of rules and Nifty has its own. Inverse relation is mostly just a coincidence.